Dustin Poirier states his case to finally get his rematch with Eddie Alvarez. Dustin Poirier may not like Eddie Alvarez very much but he can still appreciate one of his performances. This past weekend at UFC 218, Alvarez went to war with fellow “Ultimate Fighter” coach Justin Gaethje in one of the most highly anticipated fights of the year. Alvarez eventually got the better of Gaethje, landing a huge knee strike in the third round that earned him the knockout victory. Poirier is the first to admit he’s no fan of Alvarez after facing him earlier this year in a fight that was called a no contest after he suffered a pair of illegal knee strikes from the former lightweight champion but he won’t deny what happened on Saturday night. Compliments aside, Poirier knows that he should have been the one in the Octagon swinging punches at Alvarez after the controversial ending to their fight in May. Immediately after that fight ended, Poirier asked for a rematch and it appeared he would get his wish until the UFC opted to match up Alvarez with Gaethje instead. Poirier moved onto defeat former lightweight champion Anthony Pettis in his last fight, but now he says there’s no more denying what should happen next. Poirier wants his rematch with Alvarez. “I really got the bad end of that deal. He got rewarded with a TV show but everything happens for a reason. I got to go out against another former champ and shine. Everything happens for a reason. The big thing now is what do they do. They have to book this fight,” Poirier said. In subsequent interviews after the first fight finished, Alvarez began claiming that Poirier wanted out and that’s why the bout ended the way it did with a no contest verdict. Of course, Poirier sees things much differently, especially considering he was the one who ate the illegal strikes courtesy of Alvarez. 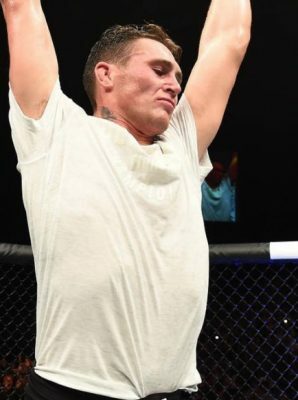 “He and I both know what went on in there and no matter what he says in interviews or what his fans say, him and I both know the truth,” Poirier said. “It doesn’t matter to me. He felt it in there what happened. I was in there. We both know what happened.